Back in the early 1940s the WPA Writers’ Project worked on a guidebook to Milwaukee similar to others in many major cities across the land. It was an extensive project which was extremely well researched and was ready for publication in early 1941. Unfortunately due to political reasons, the guide was never published and remains hidden in archives in the Library of Congress and the Wisconsin Historical Society. Although there is a labor and union related slant to the writing of the article, this was the prevailing attitude of Milwaukee at the time. A WPA Guide to Wisconsin was finished and published at the same time and was most recently reprinted in 2006. I am not sure if it had some of the same problems as the Milwaukee Guide. The following is a portion of the research I have found relating to this project. The Wisconsin State Historical Society and also the Library of Congress both have manuscripts of the guide. Both libraries have slightly varied files relating to the project and both are worth viewing if you want to learn more. From the downtown section of the city of Milwaukee northward, State 42 is a most interesting and scenic drive. The ever cool waters of Lake Michigan and the city’s finest homes in beautifully landscaped settings are the chief attractions. The present highway follows the general direction of an old Indian trail -which ran from Milwaukee to the Chippewa village at Saukville, thence to the south of the Sheboygan River and Manitowoc Rapids and from the latter, northwest to Green Bay. This article included with the file in the Wisconsin Historical Society archives explains the history of the Guide. Susan Drew, mentioned in the article, is highlighted in this article from the Milwaukee Journal of August 2, 1942.. Note on the Milwaukee Guide. Three copies of the Milwaukee Guide, prepared by the Milwaukee unit of the Federal Writers’ Project, are deposited here. This book was not published. A committee appointed by the Milwaukee County Board, co-sponsor of the Guide, was incited by a member of that committee, Miss Susan Drew, to consider the book “too socialistic.” During several months in 1940 the committee met with the state and local supervisors of the project to read through the essays. (The appended clipping from the Milwaukee Journal will give some notion of the kind of thing discussed at the meetings.) At the final meeting, in the spring of 1941, the committee, with the exception of Miss Drew, considered the material satisfactory and empowered the state supervisor to negotiate with publishers for a contract that would allow the county board to publish the book with no expense to it. In January, 1942, a contract was received from Durrell and Smith, a New York publishing house, who wished to publish the book at what would have been very little cost to the co-sponsor. By that time the war was on, and before the committee could meet to consider the contract the project was suspended. An excerpt from the Guide showing some of the socialistic slant in the writing is shown below. An understanding of Milwaukee during this time is important. This was a very industrial city comprised of many industrial workers who fought hard and somewhat violent struggles for rights we take for granted today. Milwaukee still takes pride in being a city of the working class and it seems right to write its history with that in mind. The economic problems that led to the WPA were fresh in the mind of these writers and they were addressed in these essays. Milwaukee is not without its great fortunes and its great families who exert a certain degree of economic control over its citizens. But, although many of the city’s industrial establishments were founded only a generation or so ago by mechanics and laborers, Milwaukee has shared in the national swing away from local and individual to corporate and absentee ownership. Few factories are left wherein a shirt-sleeved owner-boss can call each employee by name and be addressed in turn as “Ed” or “Charley”. Some industrialists still insist that their sons should “start from the bottom up” to learn the family business, but this custom is coming to be regarded more and more as a gesture. Milwaukee society revolves on its own axis, spinning farther and farther away from the daily life lived by the majority of the citizens residents. Milwaukee’s rich people make little ostentatious displays of wealth, perhaps because their tastes do not incline that way, perhaps because many of their fellow Milwaukeeans find such display irresistibly comic rather than impressive. The occasional hunt club “drags,” hunts after non-existent foxes, which are given serious attention by society editors, are often hailed with glee by Milwaukee newspaper columnists as an opportunity for humorous articles. The average Milwaukee resident heartily enjoys these, chuckling at a description of grown men and women dressing up in pink coats and caroling “Yoicks!” Recent publication of a local Social Register also was the subject for reportorial facetiousness. Tails and top-hats are not so common at the concert or the theater but that necks are craned at their appearance; there are few places here, with the exception of two or three exclusive clubs and some private homes, where evening dress does not render its wearer mildly conspicuous. In an obscure mezzanine floor room of the courthouse, which the visitor reaches only after getting elaborate directions, a score of men and women are agthering material on the flora and fauna, the topography and the archeology of Milwaukee. This is the nucleus of the Milwaukee district of the federal writers’ project of the works project administration (WPA). The staff, under the direction of Victor S. Craun, who has distinguished himself by his explorations of the country’s caves, will soon be enlarged to 50. The Milwaukee district will have $56,000 to spend. In six or eight months the Milwaukee “writers” will have turned out about 2,500,000 words about Milwaukee. They will explore every conceivable phase of the community’s history and physical make-up. Editors in the courthouse office will cut the number of words to 100,000 and ship them to the state headquarters at Madison, where more editors will trim Milwaukee’s contribution to about 20,000 words. Editors in the national headquarters in Washington will use their blue pencils and there will be about 8,000 words left at $7 a word – not counting costs of editing in Madison and Washington. Then government printers will be ready to publish the American Guide, in five regional volumes and on a non-commercial basis. These volumes will be filed in libraries and educational institutions for reference. Material which does not find its way to the national headquarters will be saved by the state and local offices. One of the applicants was a former Progressive candidate for the assembly. He asked the reporter not to mention the fact he was applying for a job. “It seems that Progressives aren’t supposed to get any WPA jobs,” he lamented. Some of the Progressives, Democrats and Republicans who have made vain attempts to qualify as “writers” seems hurt because jobs have been given instead to communists. A total of 150 persons were interviewed for jobs. Particular resentment was expressed by members of “capitalistic” political parties over the appointment by WPA authorities of Farrell Schnering, communist leader, to a position as a writer at $100 a month. Schnering once ran for attorney general on the communist ticket and has been editor of the Voice of Labor, communist state paper, and Milwaukee correspondent for the Daily Worker, national communist daily. Just now Schnering is working on a collection of Indian pipes at the museum. Saunders doesn’t believe that there is a possibility of getting any communistic propaganda into a treatise on Indian pipes. Another communist on the local project is Robert Collentine, who was fined in the district court last month for his part in the anti-fascist demonstration outside the office of Angelo Cerminara, Italian consular agent. Collentine is an “enumerator” and gets 90 capitalistic dollars a month. Two other active communists, Harold Hartley and Carroll Blair, sought writers’ jobs but failed to connect. Blair, the former Zona Gale scholar at the late experimental college of the University of Wisconsin, was considered qualified but he lost his chance at a $100 a month job when Schnering reported that Blair was a “trouble maker.” As a result Blair had to take a job at the common labor rate of $60 a month. Craun told his communistic workers that he didn’t care what they did after working hours, but that he expected them to attend to WPA business while on the job. Since the writers’ hours are soon to be cut from 140 to 96 hours a month, with no change in pay, Schnering and Collentine will still have plenty of time for outside activity. Saunders, who is confident the writers’ project will be of social value, emphasized that it is essentially a “research” project. He said Charles D. Stewart, Hartford (Wis.) writer, failed to recognize this distinction in writing letter to Charles E. Brown a week ago stating his reasons for not serving as a consultant on the project. “Mr. Stewart apparently wasn’t thinking of the many years he had to struggle to achieve success as a writer,” Saunders asserted. Persons in charge of the project believe it will develop into a permanent institution. 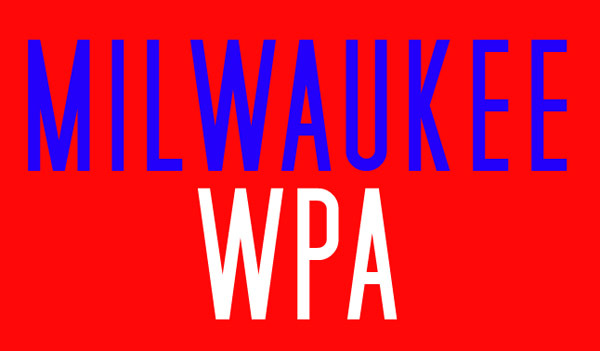 The WPA writers’ project will be scuttled by the county board, it was strongly indicated at a meeting of the board’s WPA committee Saturday. The committee had before it a letter from Mrs. Sam Corr, a WPA inspector, asking that the board renew its sponsorship of the writers’ project. Mrs. Corr said that the project has funds to continue only 10 days. The county only provides space, heat and light for the project, but the county must sponsor the project before it is given federal Funds. Mrs. Corr said that a federal appropriation of $46,671 was needed to continue the project another year. Other committeemen nodded their heads, apparently in agreement, and no one arose to defend the project. The committee decided to defer action on the proposal until a report could be obtained from the special county board committee, created a year ago, to study the Milwaukee Guide. The WPA committee said that it would like to know what the special committee has found out, and what recommendation, if any, it has to make. The Guide, it was learned, recently wax approved for publication by WPA authorities at Washington, D. C. However, the county board must appropriate $7,500 for the publication if the book is to be issued for public sale. Opposition to the book has arisen among the supervisors, and it is considered doubtful whether an appropriation will be voted. The writers’ project was set up about five years ago. The project at present gives employment to 30 persons. The new setup, if approved, would give employment to 42 persons.